Last month I found myself covered in sweat and baking under the sun in the tropical paradise of Villa Tunari. Located in the Chapare Region of Bolivia, just hours from the bustling city of Cochabamba, my arrival in Villa Tunari was like entering a new country. So different is the landscape and vegetation from that of Sucre or the city of Cochabamba it’s baffling. Much like taking a winter car drive from Phoenix AZ, to Pinetop, you know you are still in the same State but it sure doesn’t feel like it. This is the Beauty of Bolivia: snow-capped mountains, and river basins covered in green, alive with plants and animals. It was then late on the morning of Thursday November 19th that I encountered Bolivia again, a fresh, a new. It was there with startling clarity that I could acknowledge how privileged I was to be able to intake this experience. As I stood undeniably a little bit uncomfortable from the sweat pouring down my body, I could nonetheless be anything but grateful. I was in an especially beautiful area of a country that, unfortunately, many of its native Bolivians would never be able to see. My first day was spent hiking (read climbing endless stairs) to beautiful lookout over Villa Tunari in a park filled with monkeys. Dreams come true for me in that moment. I was witnessing monkeys at play in their natural environment, hiking to a glorious lookout with wonderful people in a tropical rainforest, and I survived climbing stairs for 45 minutes without dying (success!). Yet, the awesome group of kids, so full of potential, that I work with every day, here in Sucre, would likely never see this in anything but the photographs taken by my colleague. On the second day the group of about 20-30 volunteers (mostly from Germany but other countries as well) I was with took a bus trip to a national park even deeper in the rainforest. You could not wipe the smile from my face. Even though we had to go there by way of a narrow and steep road on the edge of hill, climaxing with the crossing of a bridge just wide enough for the bus I was on (if you don’t know I’m terrified of heights), I would go there again and again if I could. It was an amazing mix of nostalgia and novelty for me. Having grown up in B.C. I couldn’t help but be reminded of the Province’s temperate rainforest seeing the endless amount of green that present in everything from the leaves of trees, to the cascade of vegetation that seemed to flow down rocky cliff sides. In contrast among all these trees were novelties of plant and animal life, from birds of paradise, to a giant termites nest up in a tree. Amazing, even when it began pouring rain, I could only be thrilled at the fact that I was being poured on in a tropical rainforest, in South America. Incredibly blessed! I, who have had the privilege of knowing deciduous forests, pines cascading down mountains, and the crisp dry air of a cool desert night got to experience this too. The kids with whom I now spend so much time, know only the climate of Sucre, because in all its glorious irony they were born in the mountains of Bolivia and I in the beauty of British Columbia’s coastal rain forest. A fact, that somehow, makes it more likely that I would see the tropics of their country. A product of inequality inherit at birth. My third day was an amazing adrenalin rush. For the cost of just 150 Bolivianos (About $30 Canadian), but still out of reach for most Bolivians, I went white water rafting. 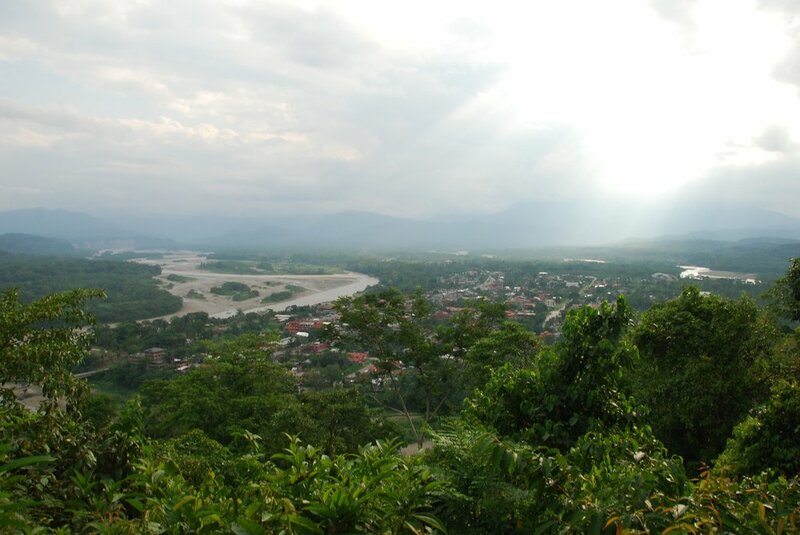 For my first trip with 11 others, also mostly rafting newbies, I encountered the tropical forest of Villa Tunari, by way of the Rio Espiritu Sancto. One of two rivers that converge at about a two minutes’ walk from the town’s centre. The other being the Rio San Mateo. 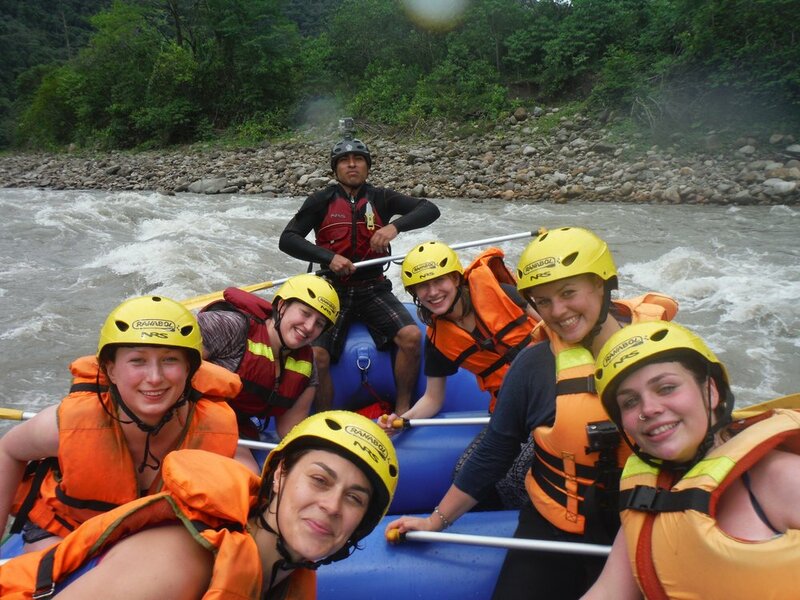 It was on a raft with five other girls and one enthusiastic and funny Bolivian guide that we battled rapids, raced and teased the remaining volunteers on their raft, swam in the river, and even jumped off cliffs. The end of the trip saw us all in smiles, with soaking wet clothes, and absolutely no regrets. The perfect finish to a perfect trip. After eating one last meal, with the other volunteers who hadn’t joined us, we boarded a bus bound for Cochabamba feeling relaxed, privileged, and blessed. Thanks for taking the time to read my ramblings once more. *I have no idea if people ever really dedicate blogs, esp. one as insignificant as this but I dedicate this to my childhood friend Hannah Farbo. At the age of 24 she passed on the week I initially wrote this from injuries sustained in a car accident. She was a woman who had a true sense of adventure as well as giving heart. Ride with the Angels in Heaven Hannah, until we meet again. Nicole is intern with Chalice in Bolivia with Levántate Mujer Foundation.